How easy it is to make people happy. To let relationships flourish. There is nothing better for Sister Sophy than that. 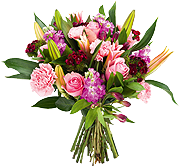 We are a premium brand of bouquets. Fair trade and exclusive. Intended for organizations that want to surprise their relations in style.